A garden walkway can be a great way to fully extend your outdoor living areas, effectively tend to your plants and fully enjoy your backyard. Creating your own garden walkway doesn’t need to break the bank. 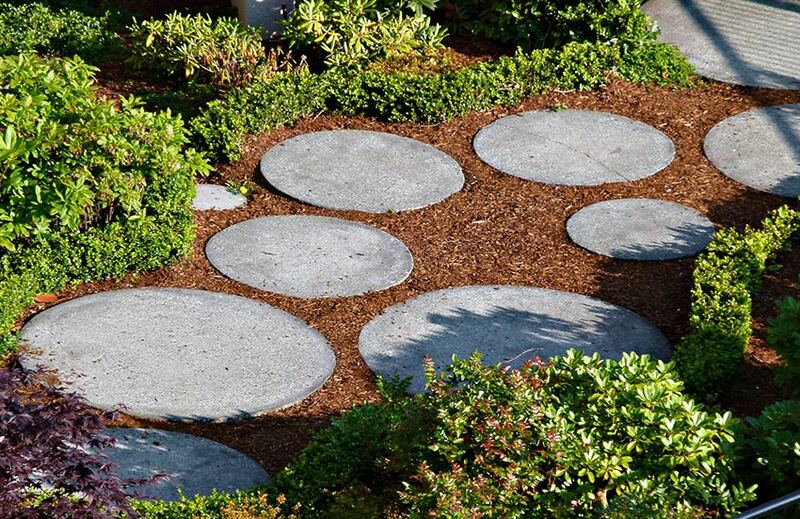 There are a variety of low cost options such as pea gravel, pavers, flagstones, bark, wood and pebbles. For those looking to create a beautiful garden path here are the best walkway ideas on a budget. The small yet cozy outdoor patio in the picture above features comfy cushioned lounge furniture on a circular arrangement of red flagstone. A solitary red flagstone is laid out vertically to the pathway entrance to serve as walkway to the smaller circle. All around the setting pebbles and boulders of varying shades and shapes are scattered around, contrasting with the greenery of tall, thin trees and potted plants. A low wood bench wall is placed at the back of the patio for extra seating space and as a contrasting design element. 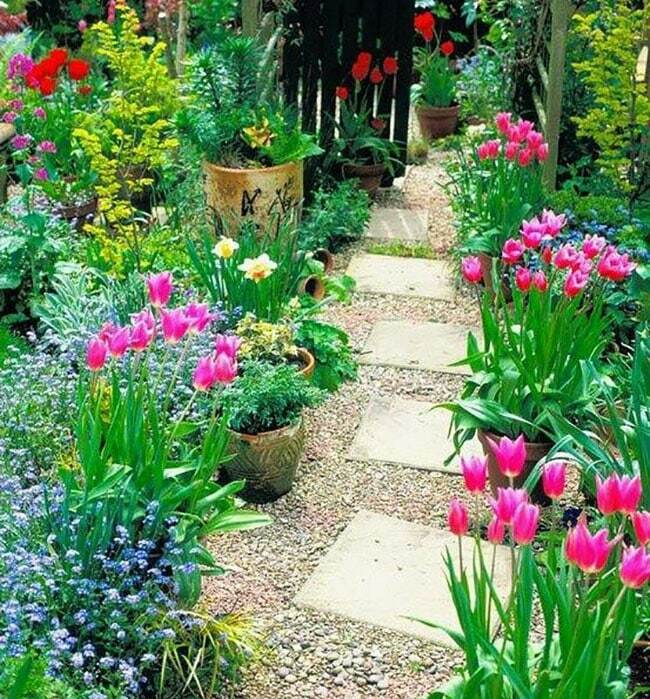 Garden walkways can make or a break a backyard. Materials need to be practical and durable, because it could be upsetting to keep replacing an expensive walkway paver that fails to meet the demands of its homeowners. It is also important to use a material that matches the surroundings, and doesn’t take away the spotlight from the flower patch you’ve worked so hard on. Lastly, it is important that the garden walkway is safe for use. The walkway will be the main path of movement in the whole garden, so it needs to be slip-resistant, highly visible and comfortable for humans (and pets) to tread on. Here are some budget friendly yet beautiful materials to use when deciding on garden walkway designs for your home. Don’t forget that these materials can be mixed and matched, to give a garden more variety aside from the usual plants and flowers. Flagstones – This may be the hardest to DIY, but large cut flat stones give any garden an instant luxe rustic feel. They also withstand harsh weather and don’t need so much maintenance, as ageing only improves their look through time. Some popular choices to use for flagstone include sandstone, travertine and limestone for a paler color tone. For bolder hues and textures, slate, bluestone or quartzite are also good options. Wood – A warm, simple addition to any garden, wood can come in different cuts and sizes, so there is wide variety when deciding what goes best in your garden. Besides aesthetic, make sure to choose a wood specie that is resistant to mold, weather and wood rot, being in such close contact to moist soil. In order to lessen maintenance needs, it would also be wise to apply a wood sealer and to inject anti-termite protection on the wood before installation. 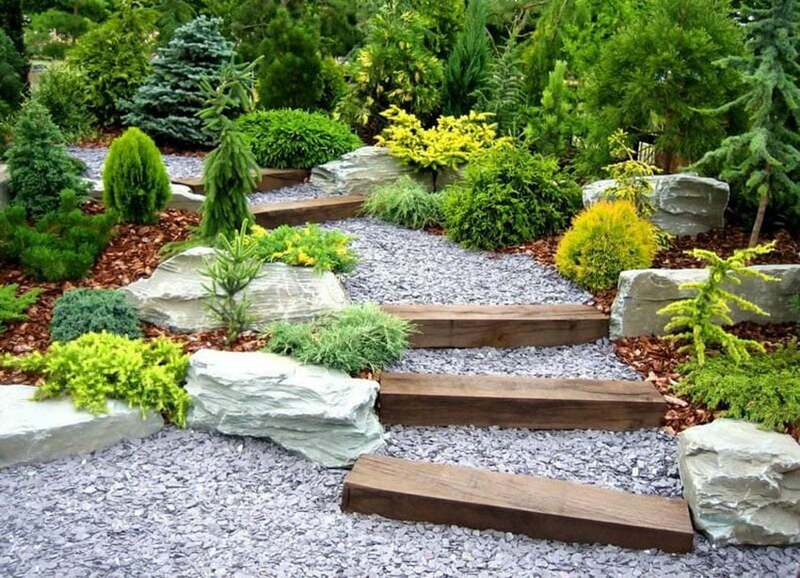 Pea gravel – A quick fix solution when needing to create a garden walkway, any gardening or construction supply store will likely sell gravel, just ask for pea gravel size or else the stones will be too large. Simple and hardy, pea gravel is great for gardens going for a more industrial feel. To avoid disarranging smaller stones, put a barrier around the area to be washed with pea gravel, preferably larger stones or a metallic or plastic lining around the edges. Pebbles – A more elegant solution to pea gravel, pebbles feature a better variety of colors and also come in nice, rounded shapes. 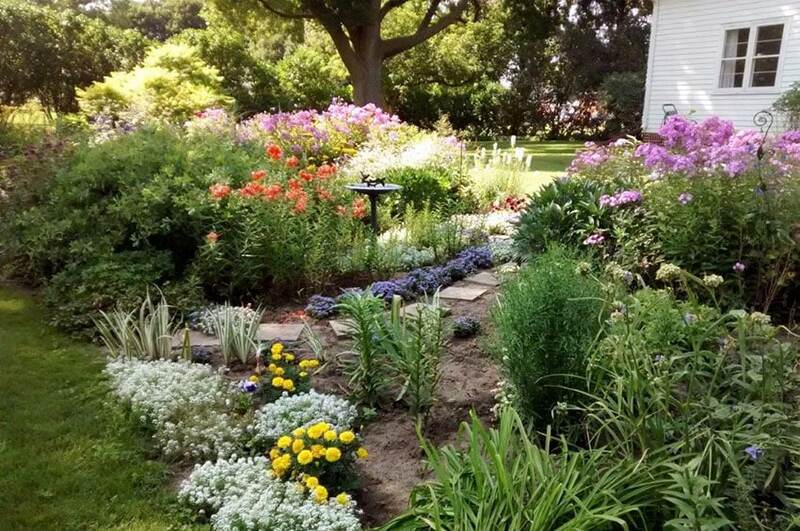 Local gardening supply stores should carry a variety of colors, shapes and sizes that can simply be poured over a dry patch of compacted soil. As with pea gravel, it is imperative that an edge barrier is installed in order to keep the stones from scattering around the garden. Concrete – One of the most basic construction materials in modern times, excess concrete from house construction can be used for quick garden walkway pavers. Whether it’s been store-bought as individual pavers already, or coming from a home DIY mold, concrete is a strong and extremely cheap solution to people on a budget who want a garden walkway. This concrete can also be used in larger swathes and shaped into regular shapes such as circles or rectangles. In addition, certain mixtures of concrete should be able to retain the print of a leaf or a top layer mold, to make the slab more non-slip and also to add design to what would normally be a mundane part of the garden. Pebble wash – To give plain old concrete a sprucing up, consider adding a layer of pebble wash on top of the concrete to give it more texture and color. 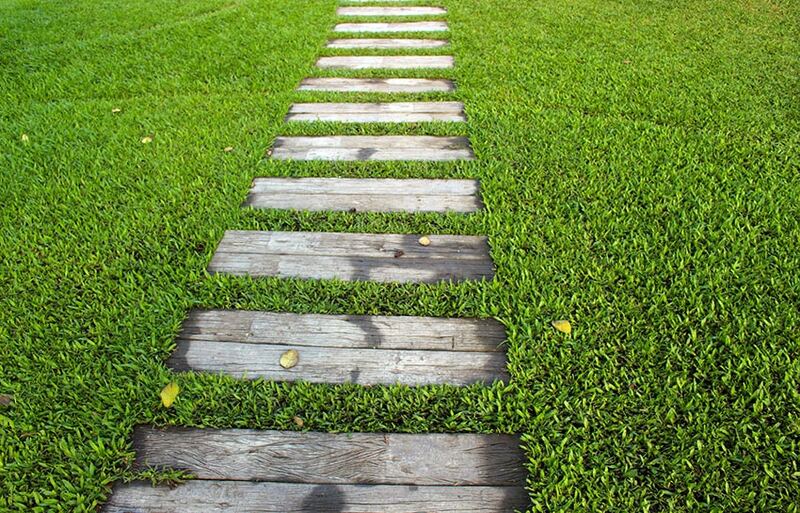 It is also a good way to enhance the non-slip qualities of garden walkways, even when moss has grown over the steps. This gorgeous garden with flowering tulips features a gray concrete paver pathway surrounded by white river road. 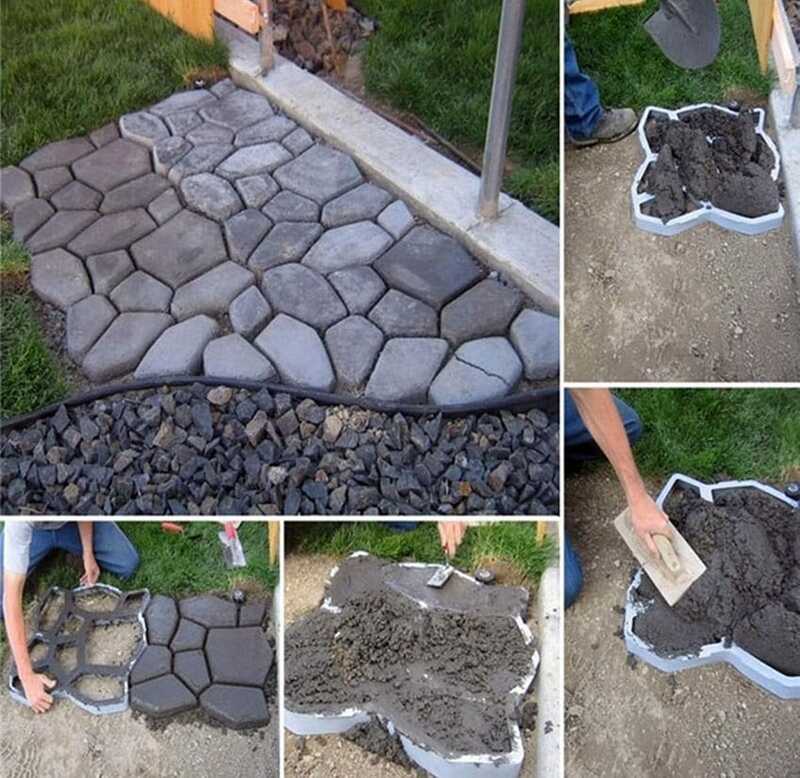 A simple DIY walkway project like this can be completed with no experience and without a lot of strain on your budget. 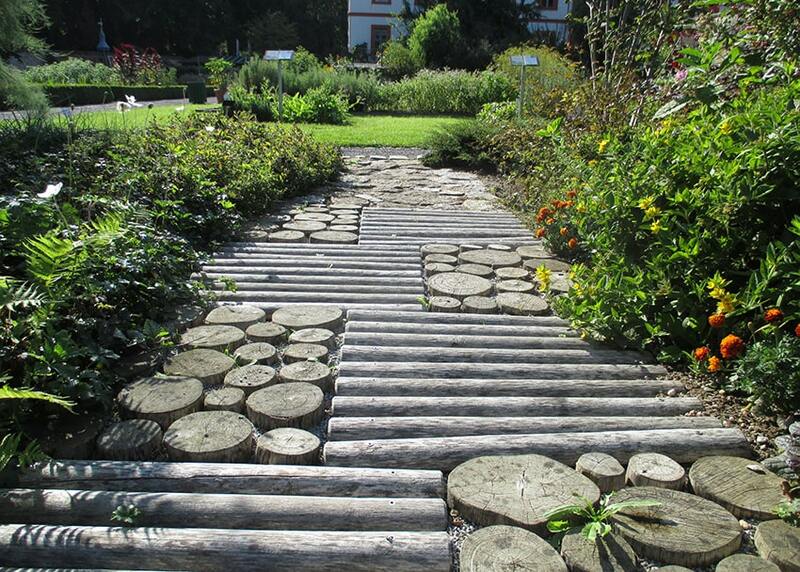 This beautiful garden path is made of gravel with laid pressure treated wood. 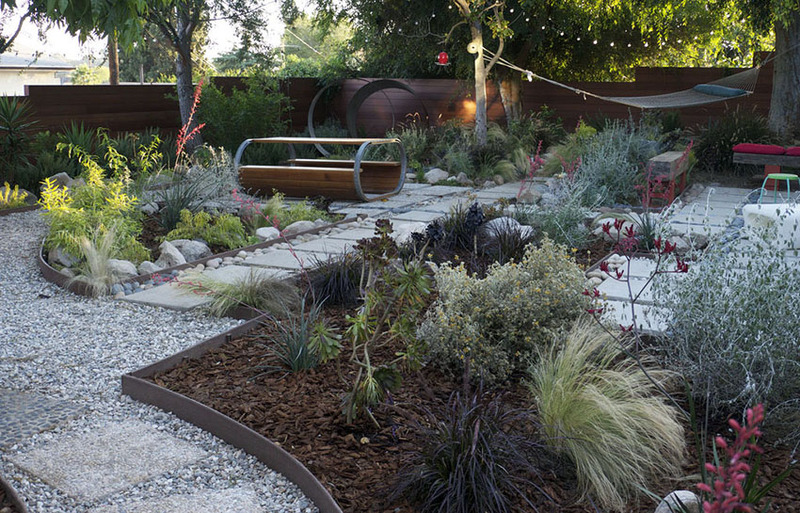 Surrounding the walkway is a bed of bark with plants and rocks interspersed to create a cohesive garden design. This backyard flower garden is the perfect spot for a budget concrete paver walkway leading from the house to the lawn area. Concrete pavers are very affordable and are easy to use. Although simple, this double-box arrangement of a front yard walkway contrasts the difference in color and texture between fresh green grass and pea gravel. 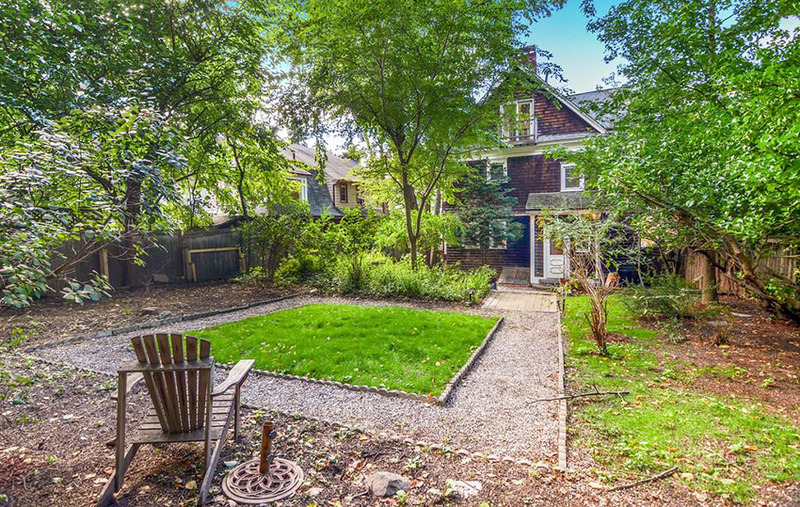 Bordered by river rocks, a sense of order is maintained, and a solitary wooden lawn chair is placed on the far end, a great way of enjoying the view of the old red brick cottage in the background. 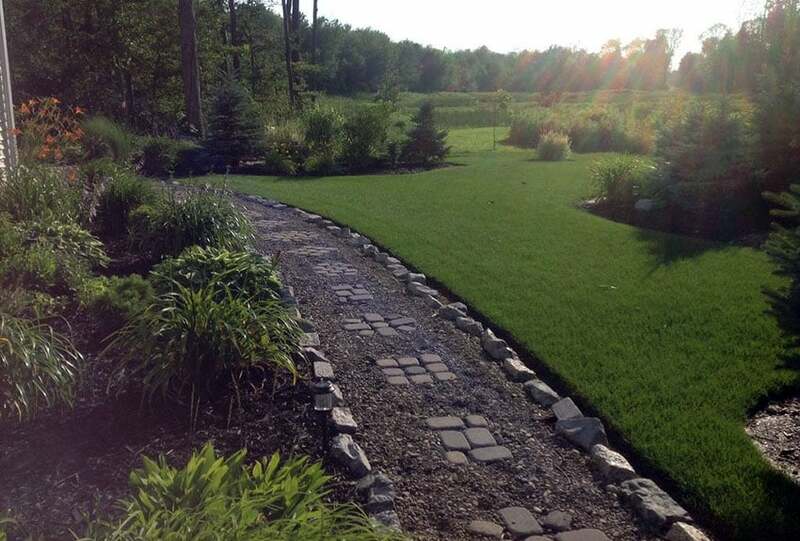 This DIY garden walkway is constructed of paver stones laid in a bed of river rock with a line of brick design for separating the path from the grass area. 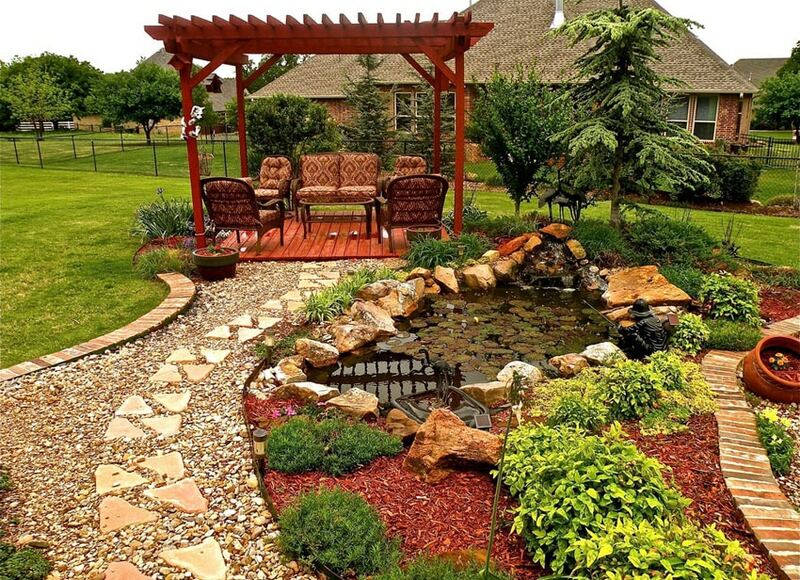 The path leads to a small wood deck with backyard pergola overlooking a small pond with rock fountain. Flat stones are laid out horizontally creating terracing on the sides for a wide collection of bushes and shrubs. To match the rustic quality of the horizontal stones, large random-shaped flagstones were used for the garden steps, as well as the landing that fans out into the garden. These flagstones can even be made of concrete, and it will be tough enough to survive all weather conditions, as well as heavy foot traffic from users. A large swathe of green lawn is patched only in places by collections of exotic plants and trees. To the side, a small footpath snakes its way around the perimeter of the garden, with low-lying bushes to one side, and a stone gravel path on the other. Made up of stone pavers arranged in a random pattern, empty spaces are filled with simple crushed gravel, all bordered by a linear arrangement of rough strewn mini boulders, to keep the path neat and orderly. This beautiful garden walkway incorporates very interesting textures in its design. Half-cylindrical mounds rise up from the ground, with rounded logs laid out horizontally along its path. Alternating diagonal squares on the path feature a collection of round cross-sections of weathered wood. These circular platforms provide a plain, flat surface, in contrast to the bumpy, unpredictable texture of the rounded logs. 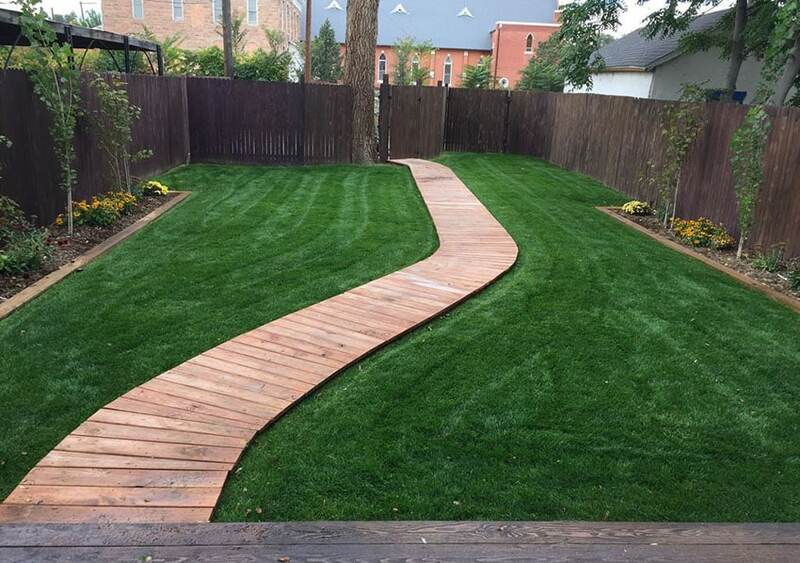 This grass turf backyard gets a quick makeover with the introduction of a reclaimed wood elevated deck walkway. Having the wood a lighter shade than the wood used for the perimeter fence design allows it to be the center of attention in this minimalist backyard. The meandering nature of the deck also allows users to enjoy the walk to and from the backyard, and provides a better visual aesthetic than a linear one. 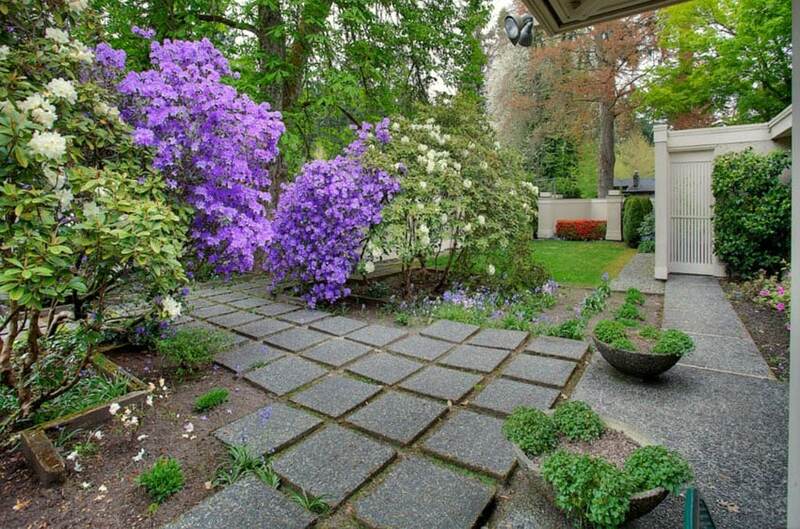 A wash of purple flowers highlights the rough, stark texture of the square garden pavers. The walkway pavers are done in a grey pebble wash finish that matches the existing pebble wash walkways attached to the house and lined with bowl-potted plants. As a material, pebble-wash is not only cheap and easy to maintain, it also resists wear and tear and is a non-slip finish even when exposed to wet conditions. 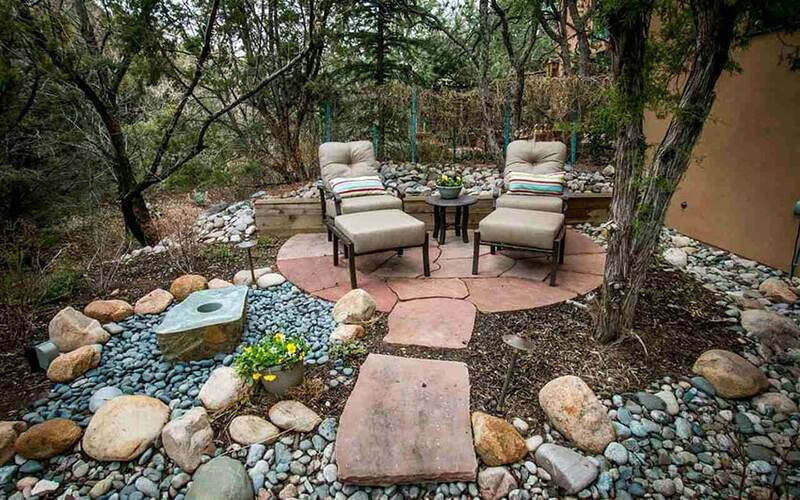 This rustic but comfortable backyard gravel patio is laid out in between larger pavers done in pebble wash. The gravel course is kept in place via metallic barriers on the side, which also holds back the soil and mulch used for the plant boxes, which feature a variety of native bushes and weeds. At the center of the garden is a prime relaxation space, featuring a Modern style wood and metal bench and table set, a high-strung fabric hammock, and low wooden benches under the large canopy trees. 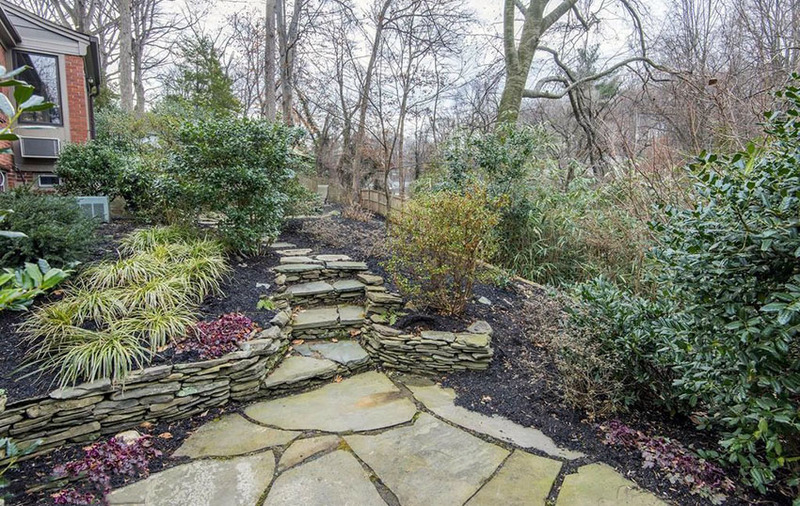 A series of curvilinear cut flagstone blocks in beige meander across this backyard garden. The light colored flagstones contrast nicely with the reddish character of the wood shavings scattered around the planting area. The rustic reclaimed wood used for the low perimeter fence, and the short rows of varied blooming flowers also contribute to the rustic charm of this backyard garden. 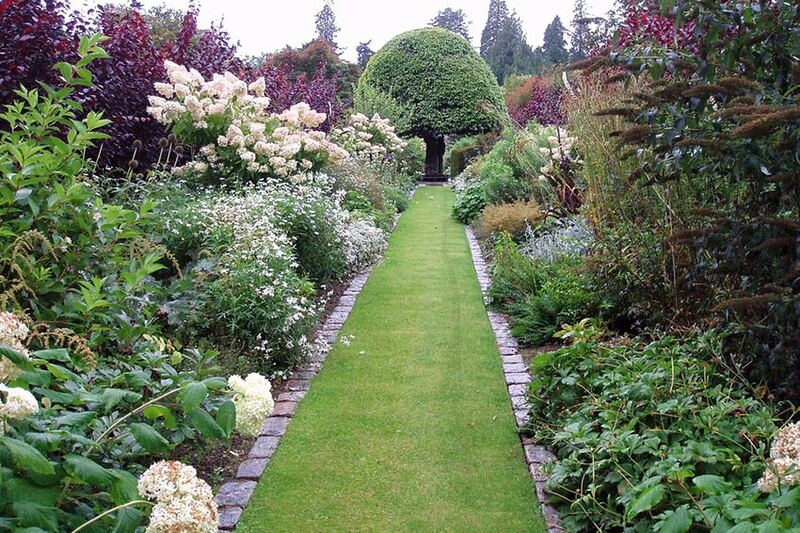 High garden plants with green and purple leaves peek alongside rows of white flowering bushes. These two planter sections surround a grass garden path, lined on each side with rectangular textured stone tiles. This grass path leads to a central tree, manicured in its shape to resemble a helmet shape. 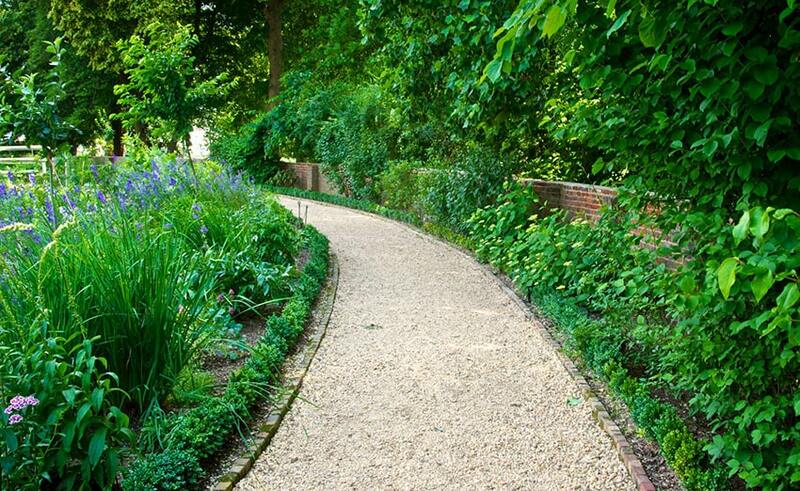 This gravel path curves around the low red brick garden wall. The off-white color of the small pebbles contrast with the overgrown vine bushes that have taken over the garden wall. In addition, the tall, vertical character of the purple lilies on the opposite side adds contrast to the horizontal nature of the gravel path and the low brick wall. 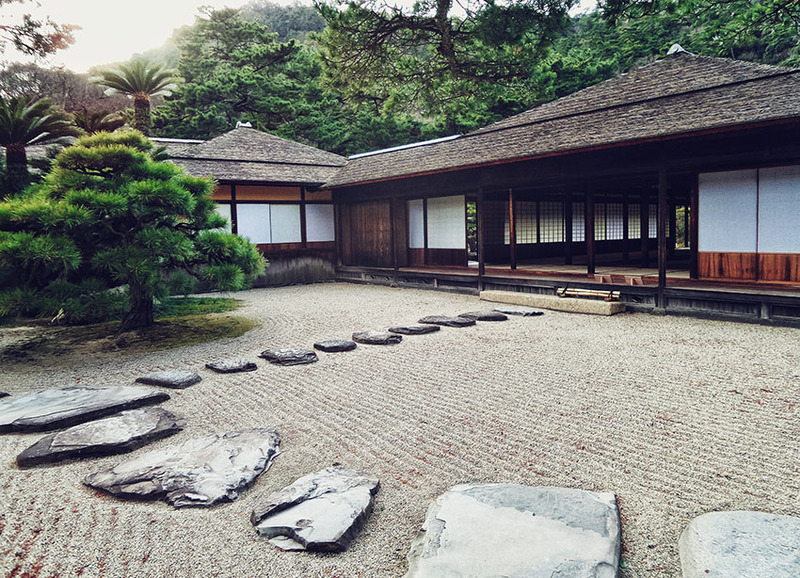 This Japanese style home features a large Zen garden outside of its austere exterior walkways. Made up of very fine gravel, this is necessary so that the tradition of combing the pebbles with a rake is possible. Large flat but rough strewn tones are laid out across the garden, leading from a large step up to the house’s hallway to the outside. A solitary bonsai tree is the only greenery in the garden, aside from the rich density of pine trees behind the house. 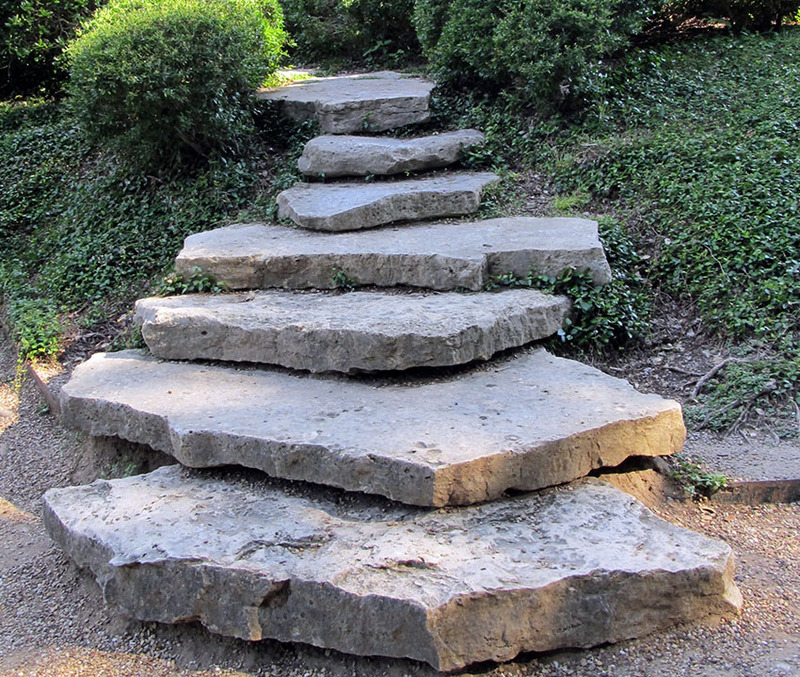 Large rough hewn stone steps are stacked on top of one another to create a series of steps that cut through a slanted grass bank. For budget reasons, the large boulders can be replaced with cast concrete, made to look weathered and worn, and then topped with appropriate water and weather sealant for longevity. 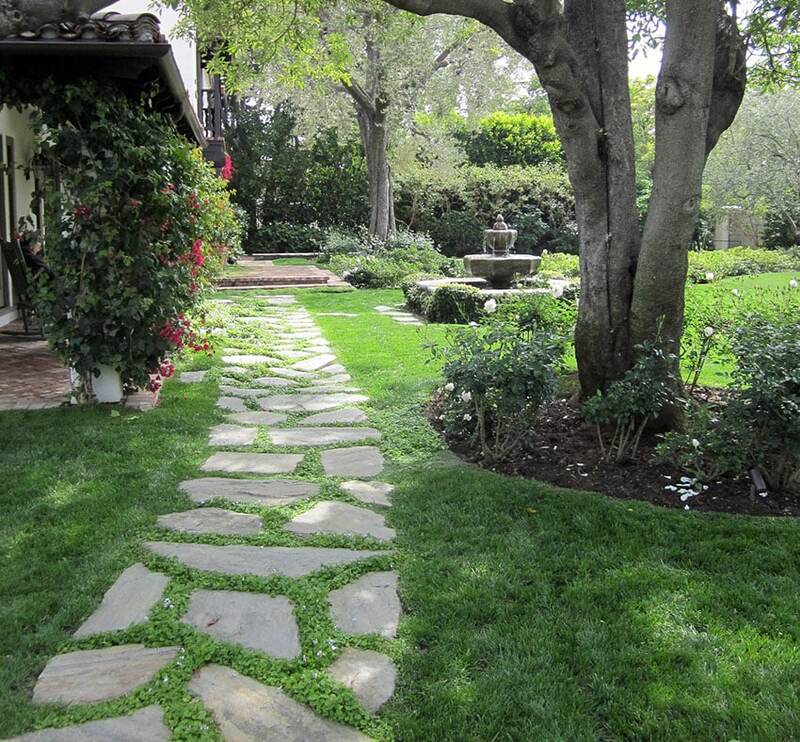 This rough flat stone path goes through the side of this rich Mission style garden. Low white rose bushes congregate around the base of larger shade trees, while the walk way leads to a central stone fountain surrounded by low bushes. To the side, red brick terracotta flooring used for the outdoor patio design contrasts in color to the plain grey walkway stone. 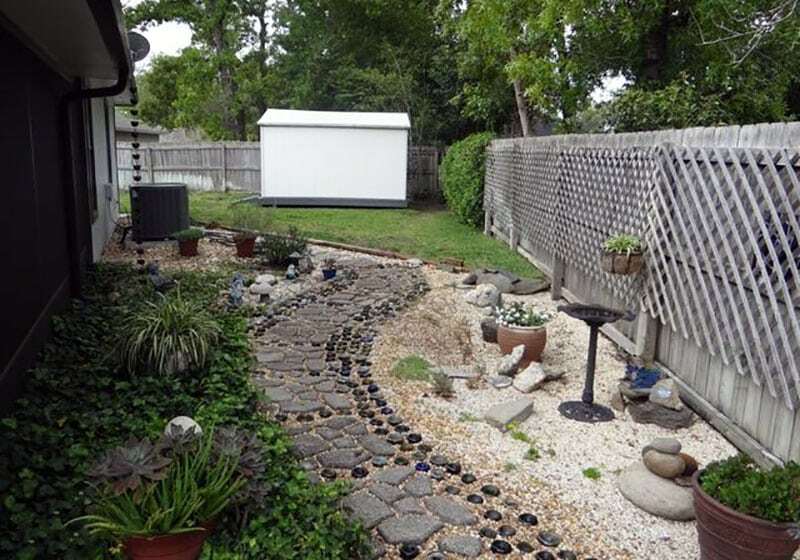 This rustic backyard area has a home made concrete stone path constructed from a resin mold that’s bordered by glass bottles in a variety of colors. 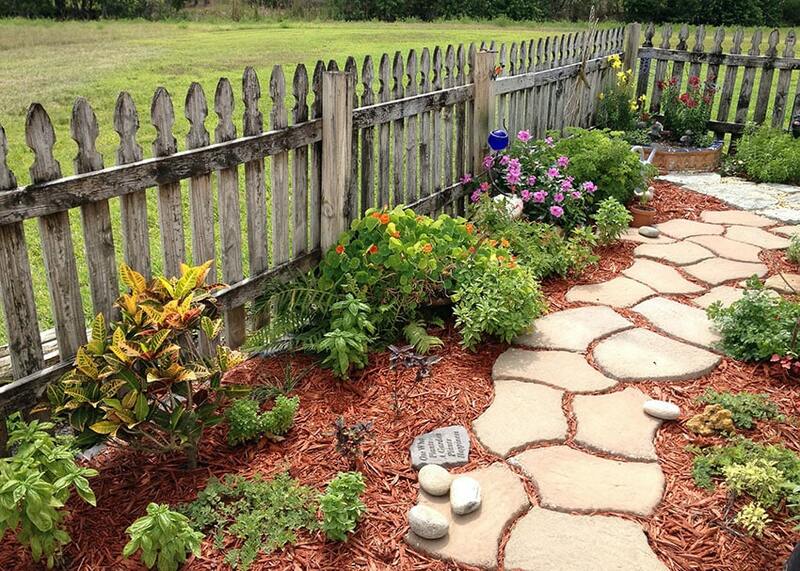 Surrounding the path is white washed gravel and a wood privacy fence. A linear series of reclaimed railroad wood is laid out horizontally on a lush patch of grass in this example. Although simple and minimalist in its design, it is actually a great way of reusing existing materials and integrating it into a newer setting to have a new life. Weathered wood like this is also known for having high resistance to heavy foot traffic, and gives a rustic character to an otherwise plain lawn walkway. Round garden pavers in differing sizes are molded from concrete and incorporated into a garden walkway. 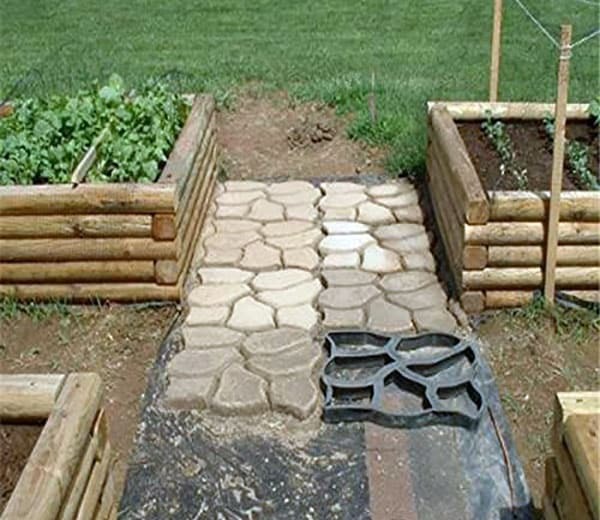 This is cheap yet efficient way of creating a walkway through a low-lying garden. Red wood shavings scattered around the steps ensure the concrete is not hurt by growing weeds, and also presents a good contrast in color and texture with the plain grey pavers. 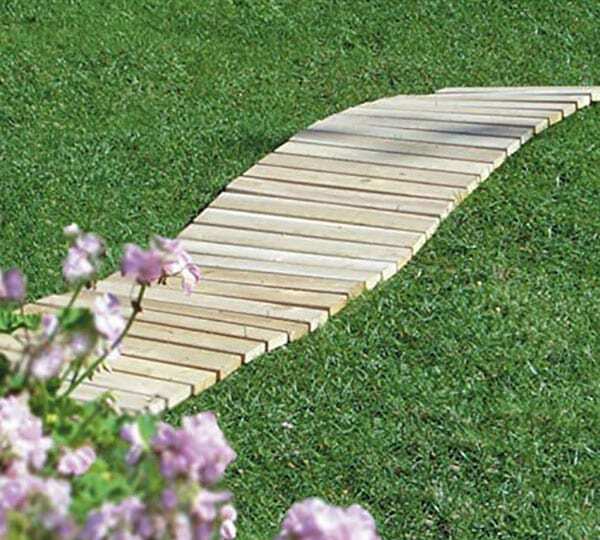 This simple garden walkway is made up of 100% Made in the USA Cedar planks. Connected together with flexible and discreet nylon cord, it literally takes minutes to set this up in the backyard. This is also a great choice for backyard owners on a budget, and is naturally low maintenance thanks to Cedar’s resistance to rot and harsh weather conditions. The pale yellowish color also makes a big splash on a pristine green lawn. Get more information about this wood garden walkway by clicking here. Great backyard ideas on a budget should be low cost and easy to install. When positioned between a grid of log-encased planters, these concrete flagstone steps are an efficient and creative way to brighten up a garden walkway. The DIY mold is made of plastic and can be used multiple times when shaping mixed concrete. In addition, the concrete can be mixed with a variety of liquid cement colors to create a bolder accent with the weathered planter wood and the green lawn. This plastic mold is one of the easiest ways to create an interesting pattern for those searching for garden walkway ideas on a budget. Low class cement can be mixed separately, and the mold can be used to cut out more interesting shapes. The dried product can then be laid out in the garden to be used as a foot path. In this example, pairing it with green grass and dark grey gravel is a good way to contrast three different textures. Get more information about a similar cement walkway mold by clicking here.